For the Opening Day starting pitchers before 1958, see List of Brooklyn Dodgers Opening Day starting pitchers. 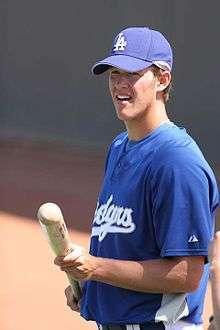 Clayton Kershaw was the Dodgers' Opening Day starting pitcher from 2011–2016. The Los Angeles Dodgers are a Major League Baseball (MLB) franchise based in Los Angeles. They play in the National League West division. The first game of the new baseball season for a team is played on Opening Day, and being named the Opening Day starter is an honor, which is often given to the player who is expected to lead the pitching staff that season, though there are various strategic reasons why a team's best pitcher might not start on Opening Day. The Dodgers have used 21 different Opening Day starting pitchers in their 57 seasons in Los Angeles. The 21 starters have a combined Opening Day record of 25 wins, 25 losses and 8 no decisions. The Dodgers started playing in Los Angeles in 1958, after moving from Brooklyn. The first Opening Day game for the Dodgers in Los Angeles was played in San Francisco against the San Francisco Giants on April 15, 1958. California native Don Drysdale was the Dodgers' Opening Day starting pitcher that day, in a game the Dodgers lost 8–0. Dodgers starting pitchers won both of their Opening Day starts in their first home ballpark in Los Angeles, Los Angeles Memorial Coliseum. Their Opening Day record in their current home park, Dodger Stadium, which opened in 1962, is ten wins, ten losses and six no decisions. That gives the Los Angeles Dodgers' Opening Day starting pitchers a total home record of twelve wins, ten losses and six no decisions. Their record in Opening Day road games is 10 wins, 14 losses and 2 no decisions. Drysdale would make seven Opening Day starts for the Dodgers between 1958 and 1969, a team record he shares with Don Sutton who accumulated them from 1972 through 1978. Fernando Valenzuela, Clayton Kershaw, Ramón Martínez and Orel Hershiser have had at least four Opening Day starts, with six, six, five and four respectively. Hall of Famer Sandy Koufax, who won three Cy Young Awards during the 1960s, only made one Opening Day start for the Dodgers, in 1964. Drysdale also holds the Los Angeles Dodgers record for most wins as an Opening Day starter, with five wins against two losses. Sutton has four wins and two losses, and one no decision. Kershaw (2011, 2013, 2014, 2016), Koufax (1964), Chan Ho Park (2001), Brad Penny (2008) and Hiroki Kuroda (2009) are the only Los Angeles Dodgers Opening Day starting pitchers to have won all their Opening Day decisions, Martinez and Derek Lowe share the Los Angeles Dodgers record for most Opening Day losses, with three. The Los Angeles Dodgers won the World Series championship in 1959, 1963, 1965, 1981 and 1988. Drysdale (1959, 1963 and 1965), and Fernando Valenzuela (1981 and 1988) were the Dodgers' Opening Day starting pitchers those years. The Dodgers' starting pitcher won the Opening Day game in 1963, 1965 and 1981, but lost in 1959 and 1988. Dodger Stadium has been the Los Angeles Dodgers' home field since 1962. Dodgers' Opening Day starting pitchers have a record there of nine wins, ten losses and five no decisions. Season Each year is linked to an article about that particular Dodgers season. 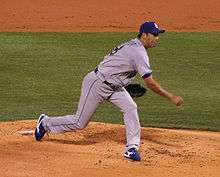 Hiroki Kuroda was the Dodgers' Opening Day starting pitcher in 2009. Brad Penny was the Dodgers' Opening Day starting pitcher in 2008. 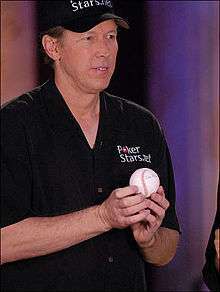 Orel Hershiser made four Opening Day starts for the Dodgers in the 1980s and 1990s. 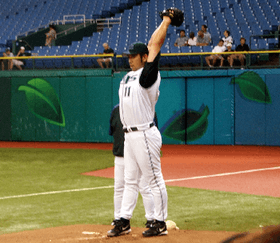 Chan Ho Park was the Dodgers' Opening Day starter in 2001. Hideo Nomo made two Opening Day starts for the Dodgers in 2003 and 2004. "Dodgers Opening Day Lineups". MLB.com. Retrieved 2008-10-02. "Los Angeles Dodgers Opening Day Starters and Results". Baseball-Reference.com. Retrieved 2008-09-21. 1 2 3 4 5 6 7 8 9 10 "Los Angeles Dodgers Opening Day Starters and Results". Baseball-Reference.com. Retrieved 2008-09-21. 1 2 3 "LA Dodgers 4, San Diego 1". Yahoo!. Retrieved 2009-04-06. ↑ "Los Angeles Dodgers History and Encyclopedia". Baseball-Reference.com. Retrieved 2008-09-21. ↑ "Don Drysdale". Baseball-Reference.com. Retrieved 2008-12-13. ↑ "Most Valuable Player MVP Awards & Cy Young Awards Winners". Baseball-Reference.com. Retrieved 2008-12-02. 1 2 "Los Angeles Dodgers Opening Day 1959". Baseball-Reference.com. Retrieved 2008-11-27. 1 2 "Los Angeles Dodgers Opening Day 1962". Baseball-Reference.com. Retrieved 2008-11-27. 1 2 "Los Angeles Dodgers Opening Day 1965". Baseball-Reference.com. Retrieved 2008-11-27. 1 2 "Los Angeles Dodgers Opening Day 1981". Baseball-Reference.com. Retrieved 2008-11-27. 1 2 "Los Angeles Dodgers Opening Day 1988". Baseball-Reference.com. Retrieved 2008-11-27. ↑ "Los Angeles Dodgers Opening Day 1958". Baseball-Reference.com. Retrieved 2008-11-27. ↑ "Los Angeles Dodgers Opening Day 1960". Baseball-Reference.com. Retrieved 2008-11-27. ↑ "Los Angeles Dodgers Opening Day 1961". Baseball-Reference.com. Retrieved 2008-11-27. ↑ "Los Angeles Dodgers Opening Day 1963". Baseball-Reference.com. Retrieved 2008-11-27. ↑ "Los Angeles Dodgers Opening Day 1964". Baseball-Reference.com. Retrieved 2008-11-27. ↑ "Los Angeles Dodgers Opening Day 1966". Baseball-Reference.com. Retrieved 2008-11-27. ↑ "Los Angeles Dodgers Opening Day 1967". Baseball-Reference.com. Retrieved 2008-11-27. ↑ "Los Angeles Dodgers Opening Day 1968". Baseball-Reference.com. Retrieved 2008-11-27. ↑ "Los Angeles Dodgers Opening Day 1969". Baseball-Reference.com. Retrieved 2008-11-27. ↑ "Los Angeles Dodgers Opening Day 1970". Baseball-Reference.com. Retrieved 2008-11-27. ↑ "Los Angeles Dodgers Opening Day 1971". Baseball-Reference.com. Retrieved 2008-11-27. ↑ "Los Angeles Dodgers Opening Day 1972". Baseball-Reference.com. Retrieved 2008-11-27. ↑ "Los Angeles Dodgers Opening Day 1973". Baseball-Reference.com. Retrieved 2008-11-27. ↑ "Los Angeles Dodgers Opening Day 1974". Baseball-Reference.com. Retrieved 2008-11-27. ↑ "Los Angeles Dodgers Opening Day 1975". Baseball-Reference.com. Retrieved 2008-11-27. ↑ "Los Angeles Dodgers Opening Day 1976". Baseball-Reference.com. Retrieved 2008-11-27. ↑ "Los Angeles Dodgers Opening Day 1977". Baseball-Reference.com. Retrieved 2008-11-27. ↑ "Los Angeles Dodgers Opening Day 1978". Baseball-Reference.com. Retrieved 2008-11-27. ↑ "Los Angeles Dodgers Opening Day 1979". Baseball-Reference.com. Retrieved 2008-11-27. ↑ "Los Angeles Dodgers Opening Day 1980". Baseball-Reference.com. Retrieved 2008-11-27. ↑ "Los Angeles Dodgers Opening Day 1982". Baseball-Reference.com. Retrieved 2008-11-27. ↑ "Los Angeles Dodgers Opening Day 1983". Baseball-Reference.com. Retrieved 2008-11-27. ↑ "Los Angeles Dodgers Opening Day 1984". Baseball-Reference.com. Retrieved 2008-11-27. ↑ "Los Angeles Dodgers Opening Day 1985". Baseball-Reference.com. Retrieved 2008-11-27. ↑ "Los Angeles Dodgers Opening Day 1986". Baseball-Reference.com. Retrieved 2008-11-27. ↑ "Los Angeles Dodgers Opening Day 1987". Baseball-Reference.com. Retrieved 2008-11-27. ↑ "Los Angeles Dodgers Opening Day 1989". Baseball-Reference.com. Retrieved 2008-11-27. ↑ "Los Angeles Dodgers Opening Day 1990". Baseball-Reference.com. Retrieved 2008-11-27. ↑ "Los Angeles Dodgers Opening Day 1991". Baseball-Reference.com. Retrieved 2008-11-27. ↑ "Los Angeles Dodgers Opening Day 1992". Baseball-Reference.com. Retrieved 2008-11-27. ↑ "Los Angeles Dodgers Opening Day 1993". Baseball-Reference.com. Retrieved 2008-11-27. ↑ "Los Angeles Dodgers Opening Day 1994". Baseball-Reference.com. Retrieved 2008-11-27. ↑ "Los Angeles Dodgers Opening Day 1995". Baseball-Reference.com. Retrieved 2008-11-27. ↑ "Los Angeles Dodgers Opening Day 1996". Baseball-Reference.com. Retrieved 2008-11-27. ↑ "Los Angeles Dodgers Opening Day 1997". Baseball-Reference.com. Retrieved 2008-11-27. ↑ "Los Angeles Dodgers Opening Day 1998". Baseball-Reference.com. Retrieved 2008-11-27. ↑ "Los Angeles Dodgers Opening Day 1999". Baseball-Reference.com. Retrieved 2008-11-27. ↑ "Los Angeles Dodgers Opening Day 2000". Baseball-Reference.com. Retrieved 2008-11-27. ↑ "Los Angeles Dodgers Opening Day 2001". Baseball-Reference.com. Retrieved 2008-11-27. ↑ "Los Angeles Dodgers Opening Day 2002". Baseball-Reference.com. Retrieved 2008-11-27. ↑ "Giants 9, Dodgers 2". ESPN. Retrieved 2008-09-25. ↑ "Los Angeles Dodgers Opening Day 2003". Baseball-Reference.com. Retrieved 2008-11-27. ↑ "Dodgers' Nomo tosses four-hit shutout". ESPN. Retrieved 2008-09-25. ↑ "Los Angeles Dodgers Opening Day 2004". Baseball-Reference.com. Retrieved 2008-11-27. ↑ "Lawrence stingy, Nevin grand for San Diego". ESPN. Retrieved 2008-09-25. ↑ "Los Angeles Dodgers Opening Day 2005". Baseball-Reference.com. Retrieved 2008-11-27. ↑ "Giants prevail over rivals even without Bonds". ESPN. Retrieved 2008-09-25. ↑ "Los Angeles Dodgers Opening Day 2006". Baseball-Reference.com. Retrieved 2008-11-27. ↑ Gurnick, Ken (April 3, 2006). "Dodgers drop thrilling opener". MLB.com. Retrieved 2008-09-21. ↑ "Los Angeles Dodgers Opening Day 2007". Baseball-Reference.com. Retrieved 2008-11-27. ↑ Jenkins, Chris (April 2, 2007). "Brewers 7, Dodgers 1". Associated Press. Retrieved 2008-09-21. ↑ "Los Angeles Dodgers Opening Day 2008". Baseball-Reference.com. Retrieved 2008-11-27. ↑ "Torre wins Dodgers debut as L.A. roughs up Zito". ESPN. Retrieved 2008-09-21. ↑ "Pirates 11, Dodgers 5". MLB. Retrieved 2010-04-05. ↑ "LA Dodgers 2, San Francisco 1". Yahoo!. Retrieved 2011-04-01. ↑ Gurnick, Ken. (2012-04-06) Kershaw's moxie sets tone as LA tops Friars. Losangeles.dodgers.mlb.com. Retrieved on 2012-04-06. ↑ Gurnick, Ken (2013-04-01). "Kershaw dazzles with shutout, homer vs. Giants". Losangeles.dodgers.mlb.com. ↑ "Dodgers 3, D-backs 1". mlb.com. March 22, 2014. Retrieved March 22, 2014. ↑ "Dodgers 6, Padres 3". mlb.com. April 6, 2015. Retrieved April 6, 2015. ↑ "Dodgers 15, Padres 0". mlb.com. April 4, 2016. Retrieved April 4, 2016.